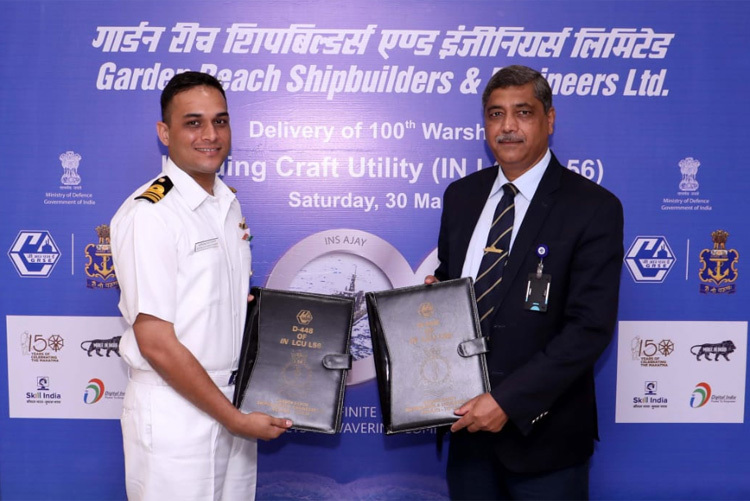 Garden Reach Ship Builders and Engineers Ltd. (GRSE), a Mini-Ratna - Category 1 and a leading Public Sector Defence Shipyard of the country delivered its 100th warship to the Indian Navy on March 30, 2019. Thus GRSE crossed a unique landmark to emerge as the first Public Sector Defence Shipyard to build and deliver 100 warships to the Indian Navy, Indian Coast Guard and the Mauritius Coast Guard. GRSE embarked on its journey towards indigenous warship building on May 19, 1960 and the first product out of its stable was INS Ajay, Seaward Defence Boat (Mk-I) in the year 1961. 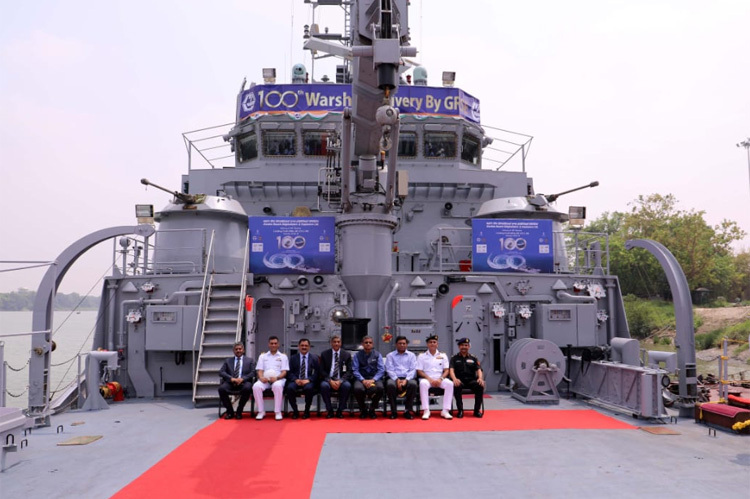 The distinguished journey spanning over nearly six decades, on March 30, 2019 has scored a century when the 100th ship from the stable of GRSE, a Landing Craft Utility, L-56 was delivered to the Indian Navy. 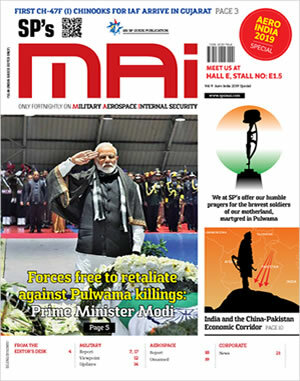 Merely three days before, on March 27, 2019 the 99th warship, a Fast Patrol Vessel was delivered to Indian Coast Guard. The 100th warship, IN LCU L-56 was formally handed over by Rear Admiral V. K. Saxena (Retired) Chairman & Managing Director, GRSE to the Commanding Officer of the Ship, Lieutenant Commander Gopinath Narayanan. Brigadier SY Deshmukh, Chief Staff Officer (Technical), Andaman &Nicobar Command carried out the Final Inspection of the Ship prior to acceptance by the Indian Navy. Shri Sanjay Mitra, IAS, Defence Secretary, Govt of India, Vice Admiral BK Verma, Commander-in-Chief, A&N Command, Vice Admiral MS Pawar, Deputy Chief of Naval Staff, Shri Apurva Chandra, IAS, Director General (Acquisition), Ministry of Defence, Commodore IB Uthaiah, Principal Director Ship Production, Integrated Headquarters, MoD (Navy), Shri Sarvjit Singh Dogra, Director (Finance), Shri Asit Kumar Nanda, Director (Personnel) and Commodore Sanjeev Nayyar (Retired), Director (Shipbuilding), GRSE and other Senior Officials of GRSE, Indian Navy were present at the Occasion. The 100th warship, a Landing Craft Utility (LCU) christened as IN LCU L56 is the sixth of an order of eight such vessels from the Indian Navy. The entire design of these LCU Mark-IV ships has been developed in-house by GRSE as per requirements specified by the Indian Navy. The construction of the balance two ships is progressing as per the schedule. LCU Mk-IV ship is an amphibious ship with its primary role being transportation and deployment of Main Battle Tanks, Armoured Vehicles, troops and equipment from ship to shore. These ships based at the Andaman and Nicobar Command, can be deployed for multirole activities like beaching operations, search and rescue, disaster relief operations, supply and replenishment and evacuation from distant islands. The LCU is 63 m in length and 11 m wide and has a displacement of 830 T with a low draught of 1.7 m. It can achieve speed of 15 knots. The LCU is designed to accommodate 216 personnel and is equipped with two Indigenous CRN 91 Guns to provide artillery fire support during landing operations. The ship is fitted with state-of-the-art equipment and advanced systems like Integrated Bridge System (IBS) and Integrated Platform Management System (IPMS). Earlier, on March 27, 2019, GRSE handed over its 99th warship, ICGS Priyadarshini, an advanced Fast Patrol Vessel (FPV) to the Indian Coast Guard. GRSE is executing order for five Fast Patrol Vessels for the Indian Coast Guard and the ship ICGS Priyadarshini, is the first in the series. The balance four ships are in advanced stages of construction. The FPV is a medium range surface vessel capable for operations in Maritime Zones of India. These fuel efficient and powerful platforms are designed to perform multipurpose operations e.g. patrolling, anti-smuggling, anti-poaching and rescue operations. The entire design of these FPVs has been developed in-house by GRSE as per requirements specified by Indian Coast Guard. The ship is 50 Meter long, 7.5 Meters wide with a displacement of around 308 Tonnes. The ship is designed for a maximum speed of 34 knots with an endurance of more than 1500 nautical miles, and is equipped with three Main Engines with Advanced Control Systems, Water Jet Units and an Integrated Bridge System integrating all Communication and Navigation systems. The ships are also fitted with 40/60 Gun as main armament and will also have improved habitability features with fully air conditioned modular accommodation for 35 personnel.